Updating a server’s RAID controller firmware the other day, I got an odd dialog window. 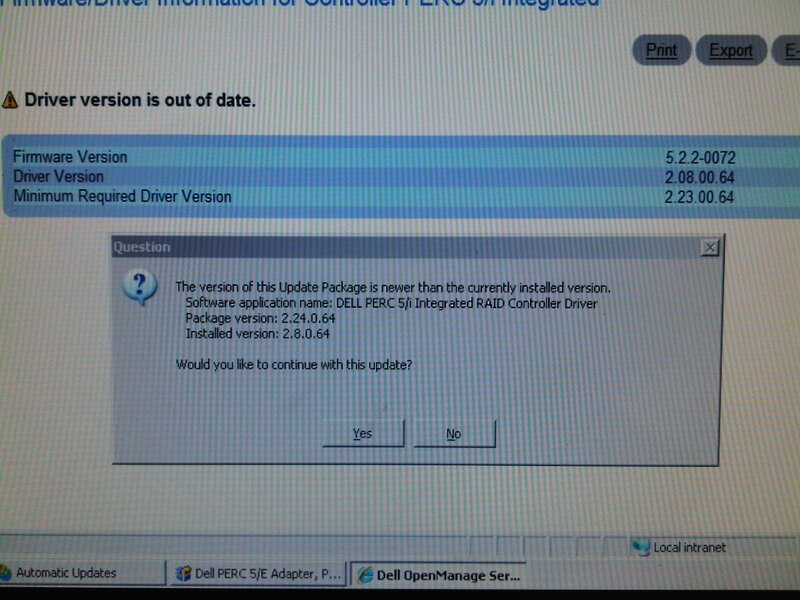 The dialog window said that the installed version was “2.8.0.64” and the update being installed was “2.24.0.64”, which looks like a downgrade. However, after checking the management console it became clear that the installed version was actually “2.08.0.64”… so my question is; why the mistake? Was this a simple typo by someone who built the installer package, or was there a bug in the detection code? Dunno, but it was a little troubling. 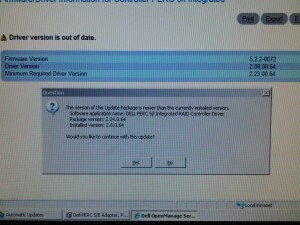 It took a small leap of faith to allow the firmware installation to proceed. This entry was posted on Thursday, November 12th, 2009 at 4:18 pm	and is filed under Server Management. You can follow any responses to this entry through the RSS 2.0 feed. You can leave a response, or trackback from your own site.